Here is an offer you may be interested in for the holidays through end of 2018. Any purchase with two or more of our Wall mounted ironing boards or mobile laundry centers or a combo earns 10% off the posted price on this page. Please call 800-739-7374 to order. Is your home space-starved for floor space? Are you tired of unpacking, erecting and then putting away that clumsy, conventional ironing board? Concerned about the cost of installing a complex, cabinet-style, built-in ironing board? Combines convenience, space efficiency, inconspicuous style and amazing affordability in one smart, simple package, designed for quick and easy D-I-Y installation. Here's the ideal solution from Better LifeStyle Products. The ORIGINAL, wall mounted LifeStyle Full-Size Ironing Center combines convenience, space efficiency, inconspicuous style and astounding affordability into one smart, simple package, designed for quick and easy D-I-Y installation. In January 2003, we demonstrated our confidence in the final design by exhibiting the LifeStyle Ironing Center at the Chicago International Housewares Show. Ten years in design and development, this unit is winning rave reviews. The LifeStyle Full-Size Ironing Center is THE affordable, high-quality Total Ironing Solution that fits in tight spaces. Extremely stable, Full-size, ventilated, STEEL mesh ironing surface: 44 in. (110cm) L x 15 in. 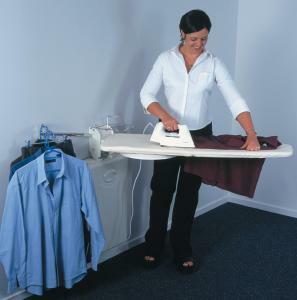 (37cm) W. Does not require any underside support or struts like other outdated ironing centers! Takes up minimal wall space! Its patented, space-saving design folds away when not in use to just 25 in. W X 23 in. H with a mere 4-½ in. wall profile! High-quality STEEL construction throughout with cast zinc alloy hinges that allow board to lie perfectly flat! Subtly stylish, detachable, Paintable ABS Wall Cover: 25 in. (59cm) W X 23 in. (63cm) H X 4½ in. (11cm) D.
Neutral, soft cream color blends with most any decor. Takes up minimal wall space, and protrudes only 4-½ inches in the stowaway state. Simple, fast D-I-Y installation. You only need to locate one wall stud! No tradesmen or special tools required! Can be mounted at any convenient height you wish! Opens parallel to the wall! THEN, swivels and locks at any angle between ZERO and 180 degrees, thereby utilizing normally unused space. Durable, high quality, padded cloth ironing board cover included! Minimizes movement during ironing. Stays on while folding and unfolding ironing board. Portability! Easy to un-mount and install in a new room or building; packs comfortably into a car trunk; weighs only 30 lbs. (boxed weight: 33 lbs.). Additional included accessories: Chrome-Plated Iron Rest, Clothes Rack, Padded Cloth Ironing Board Cover, ABS Wall Cover, Wall Mounting Plate & all required mounting hardware, installation instructions and user guide. The LifeStyle Full-Size Ironing Center is also ideal for physically-challenged users because it can be mounted at just about any height. Unbeatable value: compared to $250.00 - $700.00 for other ironing centers offering similar, but not as much, functionality. The wall mounted LifeStyle Full-Size Ironing Center is particularly practical for installation in confined spaces, such as narrow hallways, studio apartments, walk-in closets, TV rooms, boats, trailer homes, RVs, shop and theater dressing rooms, hotel & motel units, holiday cabins, assisted living homes, hospitals and clinics, airport facilities, etc. But, even where space is not a problem, you will still enjoy the many benefits of the practical, stylish and affordable LifeStyle Full-Size Ironing Center. Easy to install. Locate just one wall stud, no special tools or expertise required. Ironing Board swivels 180 degrees in either direction, to any desired angle, for right or left handed use! Replace clumsy, space-hungry old ironing boards and ironing centers. Re-assign floor space and storage space to other uses, or simply reduce clutter. Half the cost of most ironing centers, twice the functionality. Includes Chrome-Plated Iron Rest, Clothes Rack, Padded Cloth Ironing Board Cover, ABS Wall Cover, Wall Mounting Plate & all required mounting hardware, installation instructions and user guide. Highest quality materials, all STEEL construction. Very stable ironing surface due to superb design and engineering. Can the full size ironing center be rotated before opening to iron? Yes either model can be folded down from the wall and rotated a complete 180 degrees before opening to iron. What is the size of the full size ironing center in its closed position with the wall cover on? Is the wall cover required to operate the full size ironing center? Not at all, the wall cover on either ironing center is simply there to cover your ironing center when not in use. Why does the wall cover not fit flush to the wall? The cover has been designed to sit away from the wall so as not to damage the wall's surface. Can the wall cover be discarded and the ironing center be installed into a wall or a specially designed cabinet? Yes, although both ironing centers have a 4 ½” wall profile, the unique design of the main hinging system allows them to fold down 10” away from the wall to the back of the board therefore giving an approximate clearance from the face of your cabinet or wall of around 6” and still allowing a full 180 degree rotation and full use of every inch of the ironing surface. What is the color of the full size ironing center wall cover? The ABS plastic wall cover comes in a soft white and has been specially designed so that it can be painted to match any décor. I thoroughly enjoy my ironing center which we purchased several years ago from you. We installed it in my new laundry room and I could not possibly be happier!! I love this compact but full size ironing system. It takes a minimum of space and the least obtrusive when closed. The ironing board is very functional; the cloth cover, however, could be of better quality. I love my new ironing board! I appreciate your fast delivery. I ordered on Sunday and received my purchase on Thursday. Absolutely no complaints. Found everything I have purchased from you to be exactly as you represented and very good quality for the price. Well pleased with fast shipment and product received. It was very easy to locate this product on this web site and then to order it. This was a great experience as everything went as expected! Was referred by a friend...love the product and the free and fast delivery. Excellent customer service...keep up the good work! I just wanted to let you know that my order was delivered today. I am very pleased with the item that I ordered. You and your company clearly are dedicated to good customer service. I will not hesitate to purchase from your company in the future. As I'm sure you know,satisfied customers make positive statements to others. You can be assured that I will. LifeStyle OSUV-01 Vertical On Wall Mounted Ironing Board 39.75 x 15"